The New Jersey Hall of Fame Mobile Museum Curriculum Guide offers educators the opportunity to maximize a student’s learning experience before, during and after a visit. The Guide recognizes that a teacher’s time is limited and hopes to give enough background and layout information to be comfortable before seeing the museum in person. The pre-visit, visit, and post-visit lessons can be done in their entirety or hand picked by a teacher to meet his or her classes needs. The Guide is intended to focus on providing a structure to teach the importance of goal setting, planning for the future, and strategies to cope with struggles to the path of achievement. Lessons have been created with the intention of providing a resource for character education programs, guidance programming, as well as meeting the Core Content Standards for the 21st Century Learner. Lessons are designed to follow the following procedure: opening, activity, closure. Students will be required to not only conduct cross-curricular research, but also survey ideals and characteristics important to what makes them who they are. Students are also encouraged to reflect on the lessons and the application the lessons have to their lives. Inductees of the New Jersey Hall of Fame are used as models or case studies to promote the concepts of goal setting, perseverance, and achievement. Lessons are designed to link inductees to students by examining what both groups have in common. Research allows teachers and students to participate in research projects that promote an expansion of thinking beyond the traditional sense into transitional life strategies. The Mobile Museum will serve as a research center of primary sources and inspiration to take pride in the history of New Jersey and local communities. Biographies and induction speeches allow students to experience a multimedia approach to hearing about the inductees values and successes in their own words. Interactive displays also add depth to the impact inductees had on New Jersey, the United States, and even the global community. 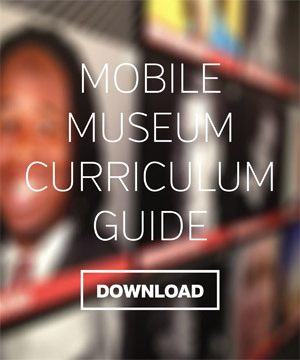 To provide additional resources to the Mobile Museum’s visit, teachers may also wish to select lessons from the New Jersey Hall of Fame Curriculum Guide. This guide focuses on the importance of voting, the qualities of effective leadership, and inductee research. This guide also provides extension opportunities to create a school hall of fame and recognize hometown heroes.